On the first shot of every hole you have a great advantage - you can give yourself a perfect lie. But 'perfect' can vary from shot to shot. When I'm on a par three playing downwind to a hard green - usually in the British Open - I actually try to put the ball atop the forward edge of a divot and hit up on it for lots of height and backspin. Other times, I may actually give myself a flyer - play a 3-wood out of a slightly grassy lie in order to maximize the 'hang time' of the ball in the air. Of course, it's also perfectly within the rules to stand outside the teeing area, as long as your tee is between the markers. The rules also allow you to move up to two club lengths back from the markers. I find this helpful on par threes where I'm torn between two clubs; I'll move to the back edge of the tee, where I'll feel more confident hitting the longer club. I also look for bad greenkeeping that might give me an edge. 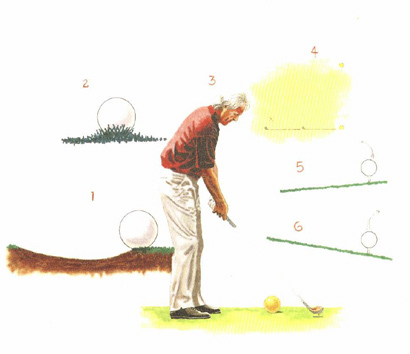 A lie with the ball above your feet will encourage a right-to-left shot, so on holes that dogleg left, I'll try to find a slight bump in the teeing area that will put that ball just a bit higher than usual. Similarly, I'll look for a dip in the tee when I want the ball below my feet to set up a shot that will slide from left to right. These advantages are small ones from the point of view of physics and golf ball ballistics, but mentally, just knowing that you have a bit of an edge can help you to make an extra-confident, productive swing.